It has been 86 years since India played its inaugural Test match at Lord's in 1932. They were humiliated in that series and till now, it has always been difficult for any Indian side to travel to England and win Tests. India has played 63 Tests in England, winning only 7 and losing 35 of them. The Indian batsmen have always struggled on the green pitches of England, whereas the spinners do not get the ambient amount of turn, which has been India's headache over the years. India had to wait 39 years for their first Test victory in England. Since then, whenever India won a game, it has been memorable for every Indian cricket fanatic. 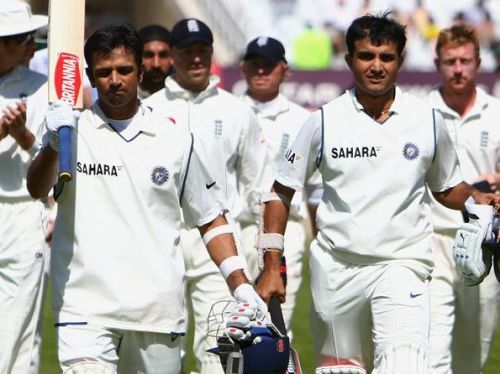 Here is the list of some of the most memorable Test victories for India in England. Five years after the famous victory at Leeds, India toured England again in 2007. The Indian team looked stronger this time after the first Test was drawn. The second Test was to be played at Nottingham. Indian skipper, Rahul Dravid won the toss and elected to field first. The English batting line-up collapsed against the swinging balls of Zaheer Khan. None of the English batsmen was able to score a fifty and Cook's 43 remained the top score of the innings. The English batsman were all-out for 198, with Zaheer Khan taking four wickets for India. India's openers provided a century partnership with both Karthik and Jaffer completing their fifties. Sachin, yet again got out in the nervous nineties, while Ganguly scored a strong 79. India was all-out for 489 with Panesar scalping four of the Indian batsmen. England came into bat with a trail of 283 runs on board and showed some class resistance. The English skipper Vaughan went on to score his century. However, a lower middle order collapse caused England to lose their last eight wickets for 70 runs and England were bowled out for 355. Zak was the pick of the bowlers again with his five-wicket haul. With a small total of 73 to chase, India managed it quite comprehensively and took an unassailable lead of 1-0 in the series.